Twin Valley South’s Cade Cottingim goes to the basket during the Panthers basketball game on Friday, Feb. 1 against Mississinawa Valley. Cottingim scored 10 to help the Panthers to a 74-42 win. 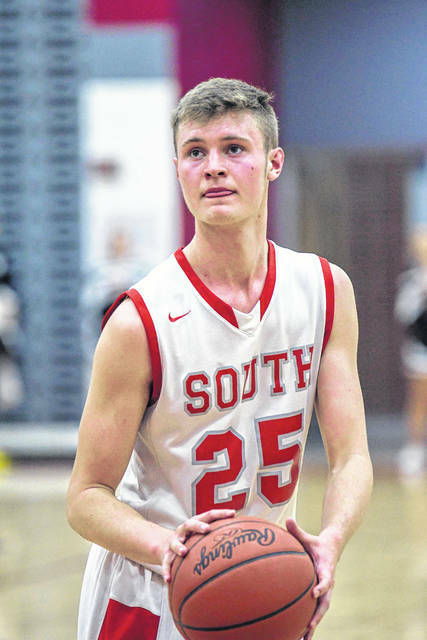 WEST ALEXANDRIA — With a pair of conference wins this past weekend, Twin Valley South’s boys’ basketball team is closing in on clinching at least a share of the Cross County Conference championship. 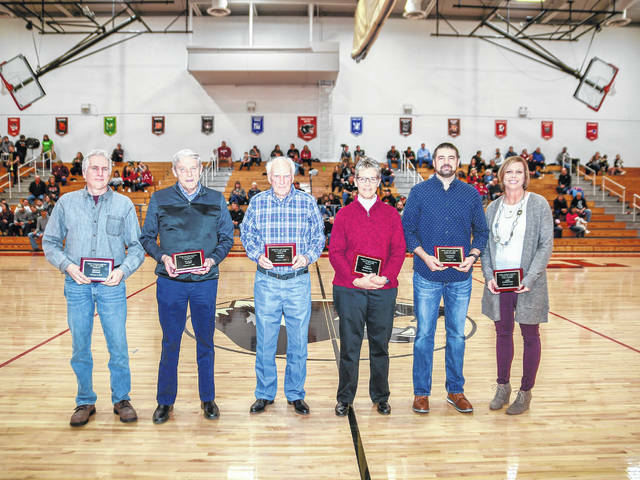 After posting a 74-42 win over Mississinawa Valley on Friday, Feb. 1, and a 72-64 win at Franklin-Monroe on Saturday, the Panthers are now 15-2 overall and 8-1 in the CCC with three conference game remaining. 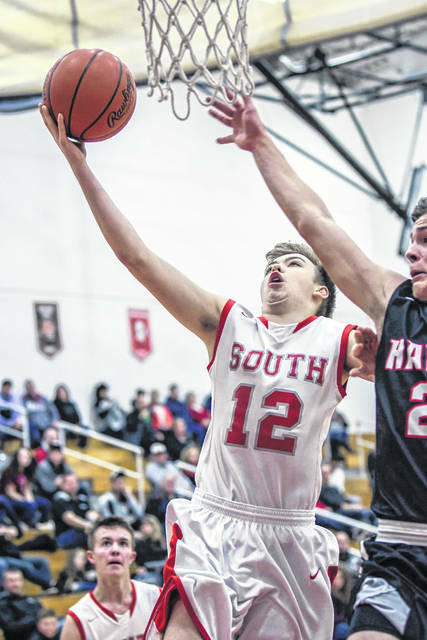 South, winners of 10 straight, will host Bradford on Friday, Feb. 8, and will entertain Bethel on Saturday, Feb. 9, in a pair of CCC games. The F-M game proved to be the more difficult of the two last weekend. “For the second Saturday in a row, I thought we did a good job of handling some on the road adversity at Franklin Monroe,” Augspurger said. FM came out shooting the ball extremely well and grabbed a 14-8 lead. 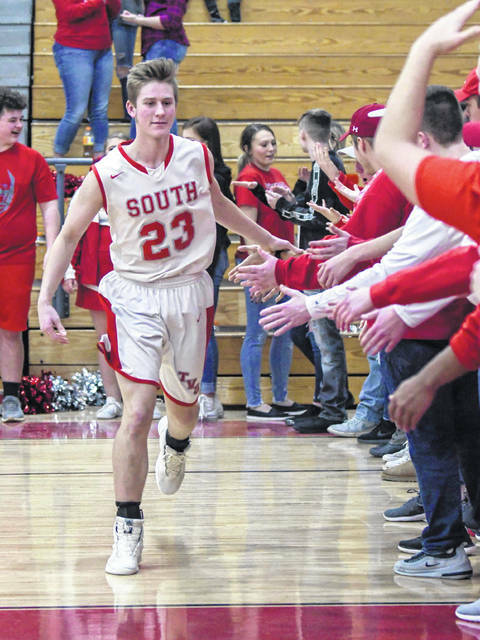 South’s Willie Bowman hit a deep three from somewhere near Arcanum, according to Augspurger, and Nate Osborn followed with back-to-back threes to give South a 17-14 lead and they never trailed again. After leading by seven at the half, the Panthers extended their lead to 14 by the end of the third. Augspurger was pleased with the overall play of his team. On Friday, Bassler turned in yet another outstanding performance with 23 points on 9-of-13 shooting. Bowman finished with 14, while Peterson tallied 13 and Cottingim 10. Bassler also added eight rebounds, four steals and four assists. Osborn had 10 assists and five rebounds. Bowman added seven rebounds, six assists and three steals. South held a 16-9 lead after the first quarter and was up 27-18 at the break. A 10-3 run to begin the second half put the Panthers in complete control and they led 46-30 after three. In the fourth, South ended the game on a 19-2 run for the final margin. 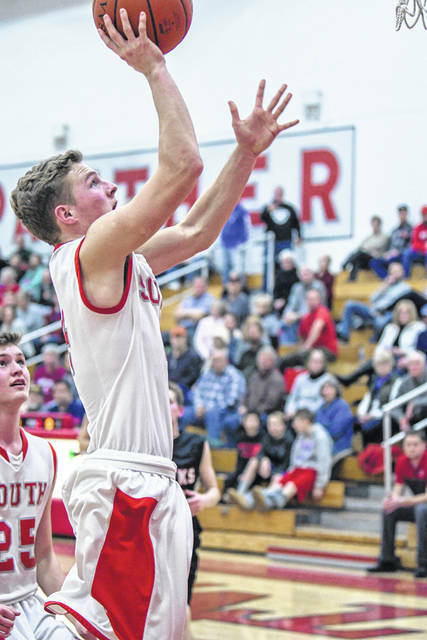 https://www.registerherald.com/wp-content/uploads/sites/41/2019/02/web1_TVSvMVHS_HOFnight22.jpgTwin Valley South’s Cade Cottingim goes to the basket during the Panthers basketball game on Friday, Feb. 1 against Mississinawa Valley. Cottingim scored 10 to help the Panthers to a 74-42 win.